Already for more than ten years, when I joined the Indian Railways fan club IRFCA and dreamed about exotic locations on MSTS, India has been one of my most desired travelling destinations. As time went by I got to know more and more people via the internet, however, I only ever met one of them - in New Zealand! Something always came inbetween, like winter steam in China, but this February plans finally materialized. During winter of course, as the dry season is ruling India, while in the European summer Monsoon rains leave their traces. For many Indians it is incomprehensible that you don't want to come during the green season they prefer, but for an European it is still a better idea, especially on a first trip - and it certainly won't be the last one - , to travel under stable, months long sunshine and a convenient constant humidity of 30%. As first preparations I bought my airline tickets in November, with Austrian Airlines the cheapest are available from 600 Euro. 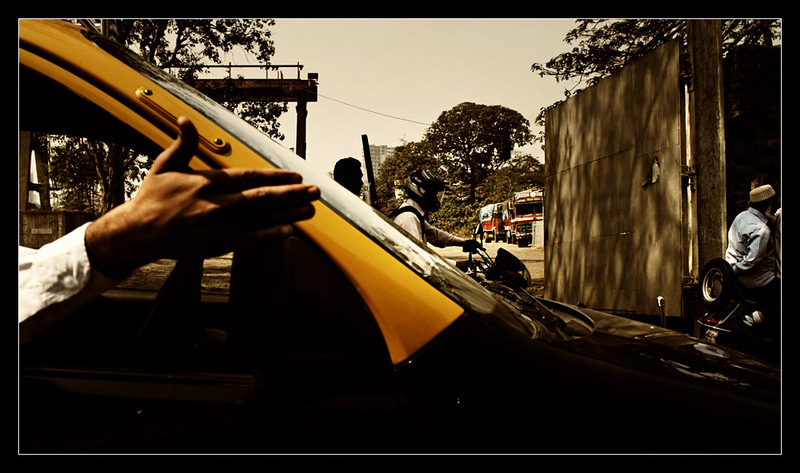 I chose Mumbai as my starting- and end-point, as I have more friends in that area and I would manage to avoid grey Delhi. 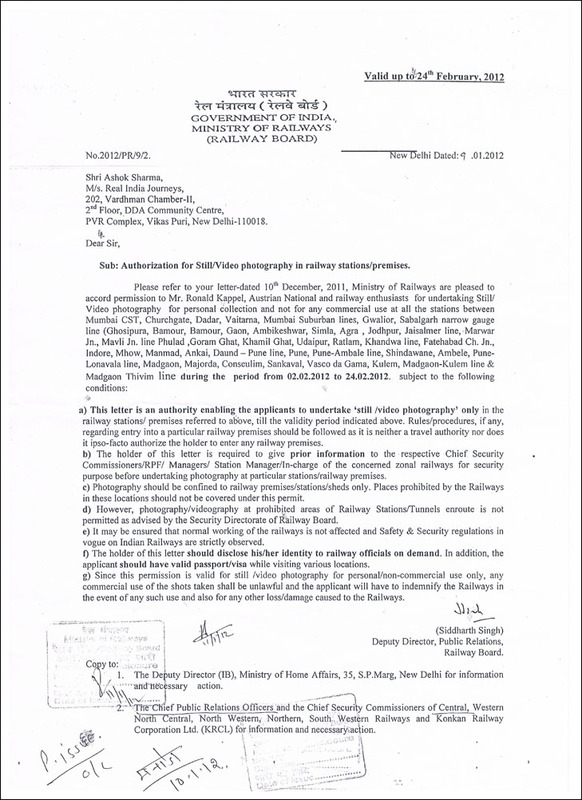 Then followed the purchase of railway tickets and the biggest challenge, getting the railway photo permit. It is necessary in India for photography on railway premises, in some cases it might be possible to do local arrangements, but on a round trip it is generally definitely recommended. As ticket I chose an Indrail Pass, even if single tickets might have been a little cheaper. With this round trip pass only available to tourists reservations can already be made one year in advance and are free of charge. Additionally you are supposed to get seats more easily later on, if needed, at least in theory. Throughout India reservations are obligatory on all long distance trains, except for general second class, which is not recommended. No wonder with this population, trains are the cheapest and most popular means of transport. For every route there is a certian quota of seats available, apart from the general quota you can also find some for various groups of people, also tourists on some trains. A few years ago the "Tatkal"-quota was introduced making extra seats available against a surcharge during the last day before departure. At all major station you will find reservation centres where available seats are listed for trains within the next days and weeks. Apart from a "confirmed" status you can also be waitlisted, everyone has a unique passenger number ("PNR") assigned, which you can use to look up information on the internet, like coach or seat number. In India a few overnight coach accomodation classes exist, apart from general second class: Sleeper (6 + 2 compartments with curtains) form the main part of most trains, A.C. Three Tier (identical to sleeper, just with AC) usually is avalable in around three coaches per train, A.C. Two Tier (4 + 2 with AC, curtains) usually one coach, depending on the importance of the connection. Some important express trains also include First Class A.C., lockable compartments of four, or the ancient First Class (non A.C). However, I took a pass valid up to AC II Tier (old First Class included) as the one for First Class A.C. would have been double the price of 400 instead of 200 Dollars for 21 days and only two overnight trains along my journey would have had this class. There even exists a much cheaper sleeper class pass, but that is really only recommended to adventurers, and you could definitely buy the cheap single tickets by yourself. A few "General Sales Agents" of Indian Railways exist in Europe, I ordered my pass from the agent in the UK, including a list of desired trains. 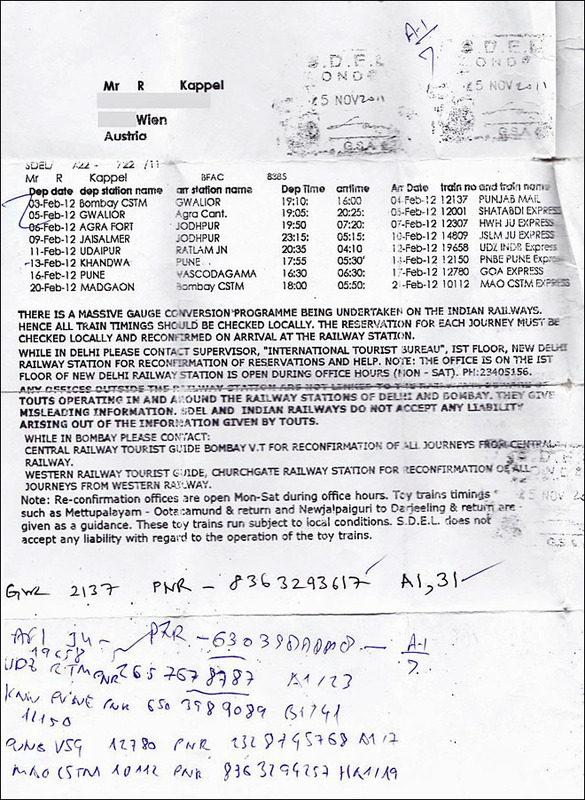 Soon the pass, reminding of good old handwritten tickets, was sent to me, a list of my trains was attached to it. The reservations had been confirmed as well, however, I did not get the PNRs or coaches and seats, next time I will have to ask for that right away, otherwise it would have spared me some hassle during he first days of the trip. 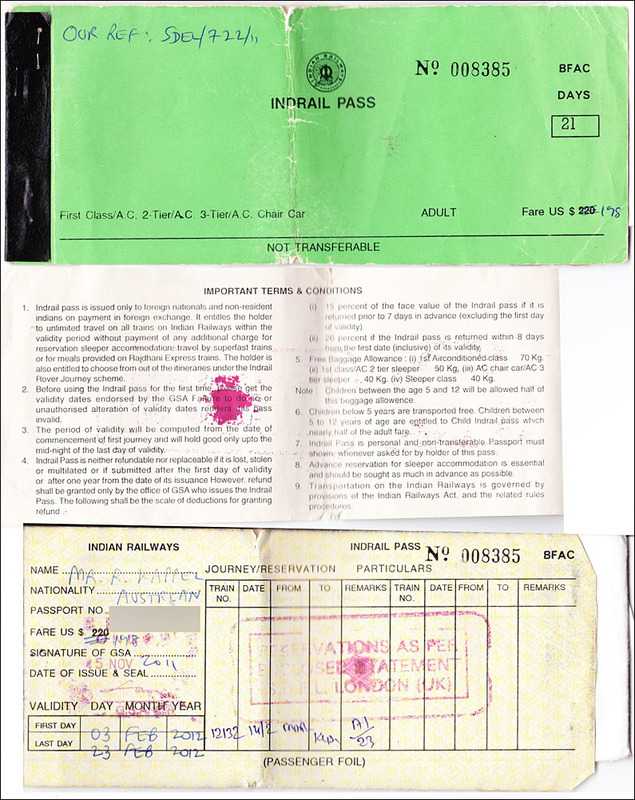 The official pages of Indrail pass. The reservation sheet, the numbers were written on it later. Equipped with the form I approached the outsourced visa issueing company (where even Austrians are employed - irony of globalisation) and tried to apply for my visa for February. Of course it did not work as you only get tourist visas two weeks ahead of departure! The ladies at the counters discussed, and I wrote a letter to the ambassador by hand. Next I wrote an email to the main address of the embassy. No one responded, and the start of the following week I personally paid a visit to the embassy main wing. It was an elegent office guarded by security, I took a seat on a comfortable coach in the waiting room. Plinthed in a corner was a giant model of an Indian Space Research Organisation rocket. I was met by a female employee, but of course ran into a principal problem: no one can imagine something like railway photography could even possibly exist. Apart from that clerks never want to take initiative or responsibility. When the lady started to ask, after reading the letter, what hidden goals I might have, I only thought: Help! How can I ever get these people to send the letter for me? But I also could remember some sayings of experienced India travellers known to me: 1 - As stubborn as Indian bureaucracy seems at first, things always work out somehow in the end. 2 - As dismissive as some officials might be during immigration preparations, as hospitable people will prove to be in the actual country. I left and waited for an email reply. Then I sent more emails, also to the consular wing of the embassy. Next afternoon I was called by an official there asking me to come over the same evening. From 4:30 to 5 documents are being distributed here, you already get a taste of real India, as it is actually just used by Indian citizens. It was an older bureau worn by time, in stark contrast to the ambassador wing, at least a tiny model satellite was hanging from the ceiling. The nice gentleman first made the early visa possible for me, he would also be able to send in the letter, but only with a copy of the visa. Next day I was called by the visa office, I could apply for the visa on December 8, an Austrian holiday - Indian institutions in Austria keep to Indian holidays - , so no other people were waiting. When retrieving the visa it was a different story, as all Christmas travellers were getting their documents. Right away I hurried to the nearest copyshop and made it just in time to post the letters the same day. It was Monday, December 12, and it had taken a full three weeks to get everything into order at the embassy. Well, at least I am a few experiences richer and know for the next time what has to be done, especially who to contact. In the end everything went without further hassle, Ashok Sharma received the permit in early January and sent it to my friend in Mumbai, the ministry had actually taken less than a month to issue it! So, saying #1 had proven to be true, and #2 would also be confirmed a hundred times over along the trip. For my friends I had a few presents in the backbag, photo books and calendars, some paper photos to show and give away, also to railroaders, and even a model train loco for my oldest contact in India, I.S. Anand in Mumbai. In the morning of February 2 finally the hour of departure was here, right at the start of the first very frosty period in Vienna this winter. The sun rose red and the exhaust steam of Schwechat refinery materialized plastically as I approached the airport. Check-in was very fast, everything is automated now with AUA, I only had to deliver my big backbag to the counter. Now I had enough time to spare, an hour before boarding I passed passport control, security checks were only performed at the gate. After having my baggage thoroughly screened, inlcuding Roco-Railjet-Taurus, I took a seat in the waiting lounge. A little more than half of the passengers were of Indian origin, including a French group where it seemed to be obligatory to wear at least one flashy pink item. The Europeans consisted of upper-class, business-class and the hippie-class travellers often seen in India. On time we boarded the 767-300ER in tranches, I took my reserved seat 11D in the centre of the first Economy Class row. While booking I had no clue how it would look like in reality, but speculating paid off. Although there partly was a wall in front of me, I found a corner where I could completely stretch out. Even better, the seat next to me stayed unoccupied, on the other end of the row a young businessman worked an Excel sheet on his MacBook for almost the complete flight. After take-off there were slight problems with the entertainment system, it had to be rebooted, then I could enjoy "Puss in Boots" in full length and got served shrimps with spinach which did not taste too bad. Sometimes you have to catch up with things you would never watch otherwise. Our capt'n from Carinthia predicted a flight time of seven hours which had to be filled. The route took us at Constanta over the Black Sea, north of Ankara through Türkei, via Baghdad and Kuwait onto the Golf and avoiding Iranian airspace flying over Dubai to the Indian Ocean, always close to the coast past Karachi and Gujarat. 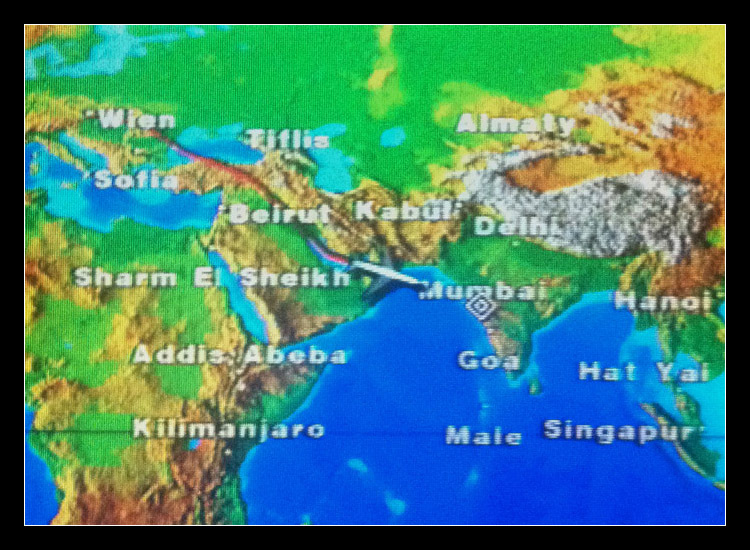 Our flight route of OS35 Wien Schwechat - Mumbai on the entertainment system. Shortly before landing an early arrival of 22:30 was announced (Indian standard time lies 4:30 ahead of central European time). Well, without taking Chhatrapati Shivaji airport into account. 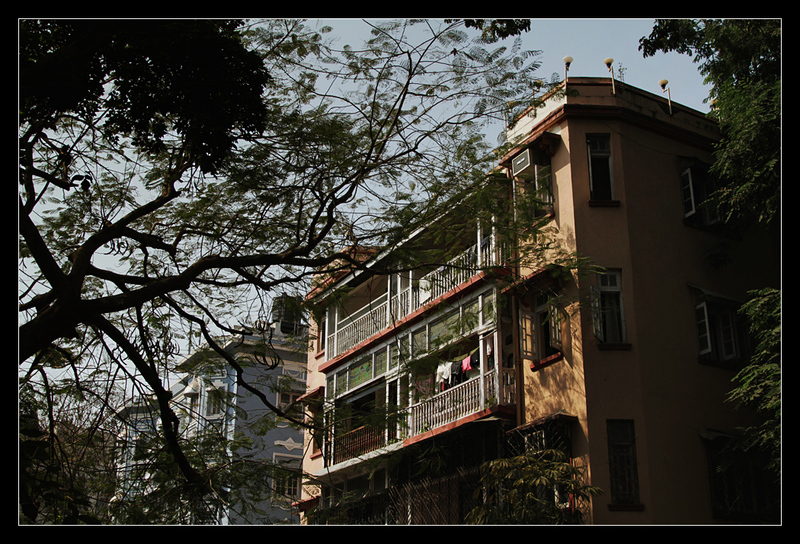 Everything went fine, we approached the peninsula of Mumbai filled with tall buildings – consisting of former islands that have been connected artificially. After touchdown we were on our way to the gate, suddenly we stopped. A few passengers started gathering their hand luggage, but the captain, alarmed by a flight attendant, announced that our final parking position still was blocked. After a few minutes we rolled on, only to soon hit the next obstacle: the unusuable jetway had been parked too close to the plane, so the stairs could not be attached. After wasting another half an hour until this issue was dealt with we finally could board a bus (Cobus 3000 – at home all over the world) to the nearby terminal. Here I immerdiately came across variously uniformed officials, I found the customs officer most impressive, clothed completely in white. But first you had to pass immigration, another form had to be filled out on the plane. The very nice elderly gentleman serving me took a little longer to type in my data, but other than that there were no obstacles apart from a few friendly questions. The backbag was soon picked up and the last thing left to do was changing money. I was advised to do this at the government bank, as all other companies would charge commission. I changed 600 Euros at a rate of 62 Rupees / 1 Euro and finally walked out into the arrival hall where hosts of taxidrivers where waiting holding up nameboards. Prepaid taxis could be found even before entering the hall, but I had ordered a pick-up service from the hotel. The friendly driver waited for me at the end of the queue and soon pushed my baggage trolley towards the car on the spacious parking deck. I had not deemed A.C. to be necessary at night, so I got round to a slightly dented small Hyundai. There were seatbelts at the rear, but the buckles to fasten them had been ripped out. Oh well, maybe it would be better to get to safety faster anyway. Thr driver paid the parking fee and a few metres further on we almost had an accident. A more elegant car in front - preferring to drive in the middle than stick to the lanes - cut in on us. As introduction to Indian traffic you have to know the following: vehicles are driven using sonar methods, without sense of hearing you would be completely lost. As soon as you are diagonally behind the driver in front of you, you have to start sounding your horn until you are sure he has taken notice of you. Most trucks have "instructions" like "blow horn" written on their back. My driver always had one thumb on the horn in a video-game like fashion, that way we tackled midnight traffic. Only once we got stuck in a traffic jam due to a minor accident ahead, the affected car was parked across the lanes almost undamaged, the former occupants were chatting leisurely standing next to it. Apart from that we proceeded very swiftly, mostly at speeds of 70 to 80 kph, sometimes uneasy feelings came up. By day at least you cannot drive that fast and the traffic lights are switched on (even if they often are ignored). Also, few lanes are free in the city by day, so overtakings across solid lines or driving on the wrong side is rarer. 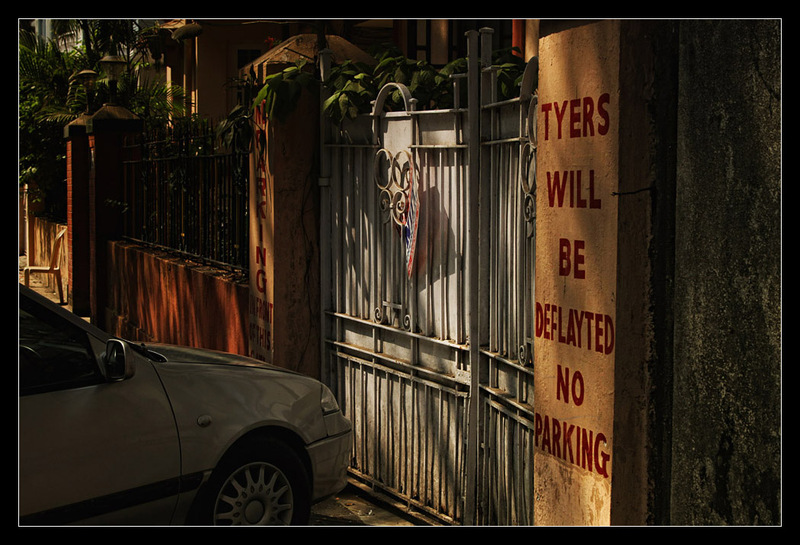 The drive still took almost an hour, as my hotel was situated in Colaba, almost on the tip of the Mumbai peninsula. Via Bandra and along the imposing Marine Drive past Chowpatty Beach we approached our destination. Shortly before reaching it I witnessed another almost-accident with two cars closing in on each other at a right angle and only stopping within two metres by emergency braking. However, I arrived safely at my hotel in an elegant street lined by mansions close to the Gateway of India. In a lovely old steel cage elevator I was brought to my room, secured from the outside by padlock, which as I later learned is standard practice for apartments in India. The room had both good and bad features, for example a very clean floor, LCD TV and a private bathroom, on the other hand the bedding on a rock hard bed did not look very inviting. I did not care about the hard matress, but I still used the provided towels and a few of my clothes to lie on. 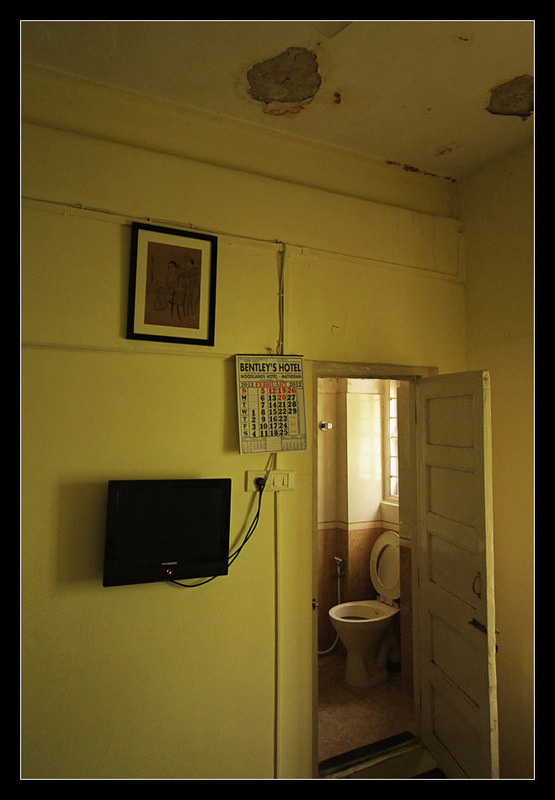 The A.C. could be switched on for extra charge, but it was not needed, as temperatures drop below 25 degress C at night, and if needed a loud ceiling fan is almost always in place. My room during the first night, the only one I booked according to a travel guide. Soon I went to sleep, although due to jetlag I just managed to rest. Also, some crows were very active all night right in front of the window, later I noticed similar occurences elsewhere. Still, I could rest until my friend and legendary Mumbai railway enthusiast Anand called me to ask if he could pick me up. Finally it was already past noon when he arrived, he had had to struggle with traffic for 1 1/2 hours to come here. I already waited in front of the gate, as most Indian hotels offer accomodation from 12 to 12 o'clock only. 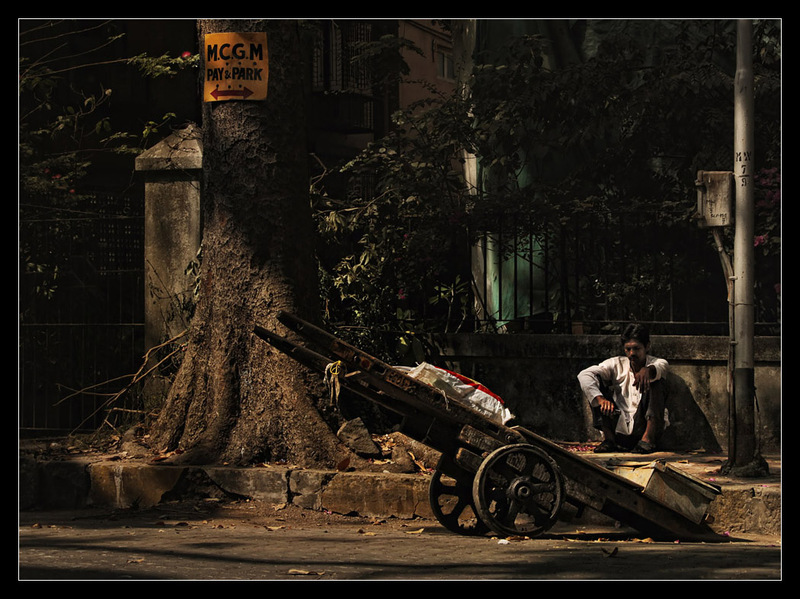 The quiet, elegant Oliver Road already showed a little of Indian street life. Various characters walked by, also some taxi drivers looking for customers in this touristy area. One of them even offered to take me to Bangalore - a drive exceeding one thousand kilometres! At the end of the street a shrine was placed right in the middle of the pavement, right next to some more taxis. Nice, old mansions predominate here. Pay & Park... even here you could not avoid Indian reality. But my friend already had arrived, first I had to get to Mumbai Chhatrapati Shivaji Terminus (CST), still called VT (Victoria Terminus) by locals, to confirm my reservation for the evening „"Punjab Mail". There is no parking space near the largest colonial building of the British Raj, so we took a risk and parked in front of some government vehicles. Quickly we searched for the Central Railway tourist bureau, but we would never find it. Even the information had no clue where it was supposed to be located. 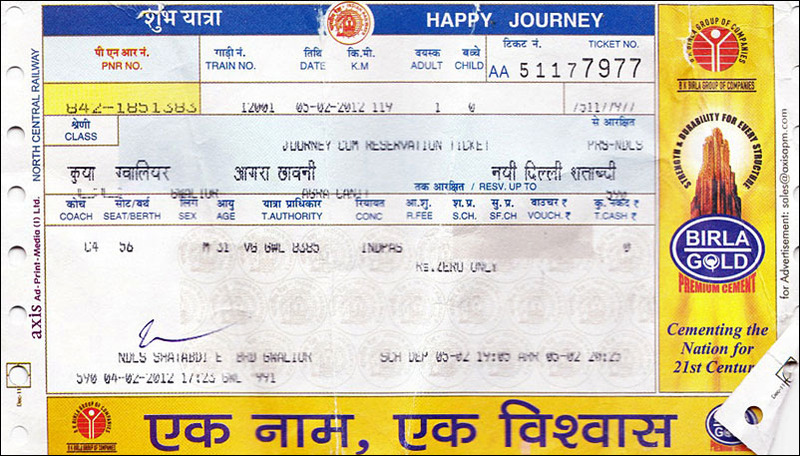 Instead we visited a regular ticket counter, the lady behind it shortly left with my Indrail-Pass, then returned and confirmed my ticket in the 2AC coach number A1, seat 31. 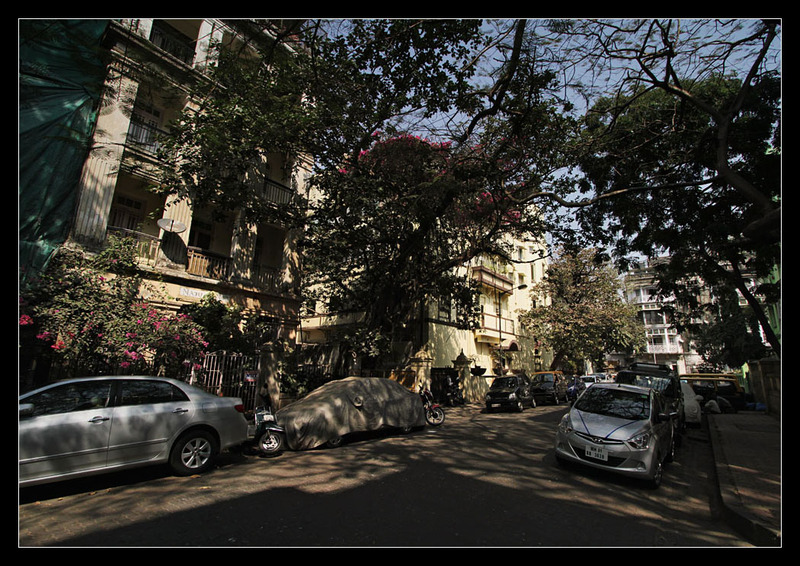 The car also had not been towed, and so we drove along the old Harbour Line, a suburban route, to the apartment in Chembur district. Now I got stronger impressions of traffic in Mumbai, without hairy situations due to more cars and more defensive driving. On the other hand the whole spectrum of vehicles and people was now on the road. Inside the city centre it was bearable as no trucks are allowed here during the day, but further north it was pure chaos. You can imagine the road surface as massive shared space, where everything from busses to handcarts tries to get its right of way. The positive side of Indian traffic is the power of pedestrians, cars stop for you and even stay behind you on narrow streets. On the other hand you sometimes cannot stop at a red light, as you not only will be beeped at from behind, but possibly even rammed. The most extravagant vehicle I saw was a cart pulled by two decorated cows transporting a ceremonial peacock boat. Later I probably saw the same two cows tied to a post down the street, other than that not a single bovine creature at Mumbai. A bottleneck had to be negotiated, on the drive from CST to Chembur. 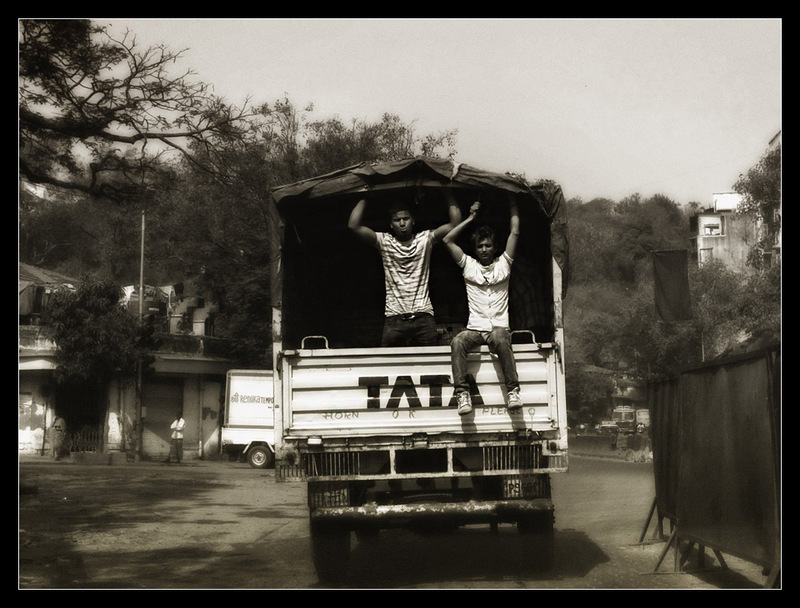 That way we drove on, through a Muslim quarter and along the Harbour line skirted by poor shacks. After less than an hour we reached Chembur, one of the richer quarters of Mumbai, but still with a huge supply of street vendors and a lot of life in the streets. I could rest now in the apartment, shortly before six o'clock we left to catch the train. From Karthik, a young railfan, we learned that Punjab Mail would depart from the new CST platforms. These are situated in a completely empty space theoretically providing parking for hundreds of vehicles. The new platforms have been constructed as new 28-coach-trains need more space than is available at the old terminal. The entrance is located at the position of the eighth coach, this should be considered when taking a train from here, as the walk from the main terminal is kilometre-long. My luggage was screened by security, and Anand bought a platform ticket. Both completely senseless, the ticket vendor even told my friend: „Why are you buying a ticket? Simply walk on the platform!“. The building is located at the platform edge, but it would be much more comfortable to walk around it! View from parking to the platforms of CST new. You can simply unload your goods here and just walk in, in the background the dome of the grand terminal in daily evening smog, by the end of the trip we will do sightseeing here! The Muezzin greeted us with his call, I was now soaking up the atmosphere of departure, how could it be anything else than a great journey if you are departing by a train with a sounding name as „Punjab Mail“? Now we had more than enough time and sat down at a bench on the platform my train would depart from. Each coach position is shown by digital displays shortly before arrival changing between train and coach number. I filled up my water bottle reserves, then we could witness an old WCG-2 pulling in a passenger train with its typical howling noise. This class should have been out of service for years and can nowadays only be operated on a few short DC kilometres from CST, as everything else has been converted to AC. Indian Railways is divided into several administrative zones, two of which classically depart from Mumbai, the Western Railway north and the Central Railway from CST, which I was about to take, east. In recent times Konkan Railway was added going south starting at the edge of the metropolitan area. 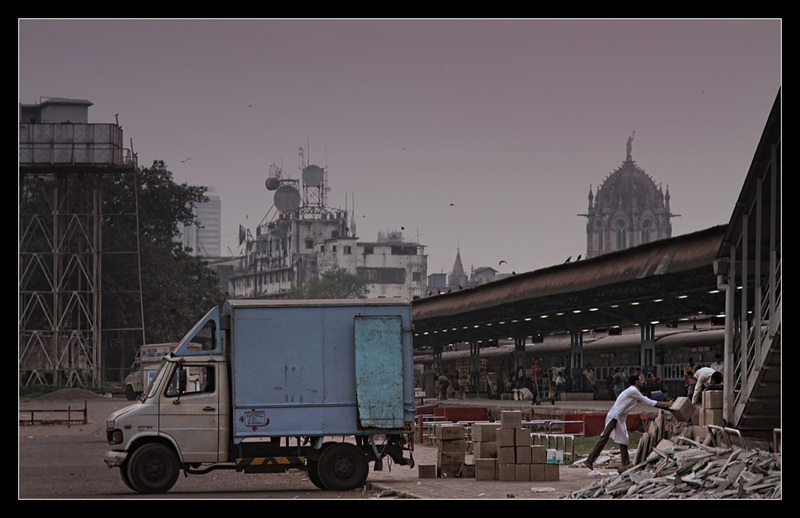 Through demand more and more terminals were created in Mumbai over the years. Locomotives are stationed in various sheds, of which each obviously has freedom of livery design, which provides an interesting diversity. The long snake of coaches of my train was hauled by a Kurla shed WDM-2 in classic brown livery acting as shunter (see video). Indian locomotive class codes consist of three to four letters and numbers. The first letter indicates gauge: We will come across W - broad gauge, Y - metre gauge, Z - 2' 6" (760 mm) narrow gauge and N - 2' (600 mm) narrow gauge on this trip. The second and sometimes third letter indicates the mode of traction: D - diesel, A - AC, C - DC, CA - AC / DC. The third/forth letter finally shows the purpose of usage: P - passenger trains, G - freight, M - multipurpose, S - shunting. My coach was located towards the rear at 20th position. I was the first passenger inside, almost an hour before departure, all in all everything presented itself much more convenient und unhectic than I had imagined. The compartment is similar to an European four-berth couchette coach, only in 2AC it is seperated from the corridor by curtains. On the opposite wall there are two more seats or berths in night mode, also with individual curtains on the corridor side. Due to broad gauge everything is a little more spacious than in Europe, however, luggage can only be stored below the lower berths. Here you can find steel rings to fasten your luggage, which I did with my backbag. It is also recommended not to leave your shoes on the floor during the night, at least not such nice trekking shoes as I bought for the trip. Long before departure official and inofficial vendors („wallahs“) passed through the train, Chai - a sweet tea with high milk portion and spices such as ginger - , coffee, tomato soup, various snacks, even USB sticks are delivered right to your seat that way. During the ride I only saw officially sanctioned vendors on the train. The 1930 kms route of 12137 "Punjab Mail" to Firozpur Cantt. (cantonment), arrival on day 3 at 5:40 a.m., I only went 1232 kms up to Gwalior. As on other maps you can ignore the gauges, a lot of metre gauge has been replace, but you can spot Gwalior - Sheopur Kalan narrow gauge. We departed with a slight delay, at the busy junction Dadar - the only changeover point to the Western Railway - a family joined me in the compartment and Karthik came shorty by with a friend to say Hello. Soon tickets were checked, meal orders taken – there are three meals per day, the train also had a pantry car – and the bedding consisting of two sheets, pillow and warm blanket delivered. Latter was necessary, as the A.C. was set quite cool. Whoever wants to leave his jacket at home because he/she is travelling to warm India should reconsider! Already during the flight A.C.s can be very cold, also it gets quite cool during winter nights in the north. After nine p.m. everyone lied down, the curtains were closed and lights turned off. The running smoothness of the coach was surprisingly good, and there were no other loud noises apart from the occasional crossing train with horn-Doppler-effect. At Nashik the forth berth was occupied by a man who stored his luggage in a clumsy fashion and later shortly a foul smelling drunkard got lost in our compartment, but other than that there were no disturbances. The vendors stop their business during the night, for absolute quiet of course earplugs are recommended. Next morning I awoke to a dream landscape, palms, other trees, humans and buildings ware bathed in a deep yellow-orange light. Soon a red fireball rose above the at this time of year dusty, arid countryside (see video). We had just reached Harda station delayed 25 minutes. 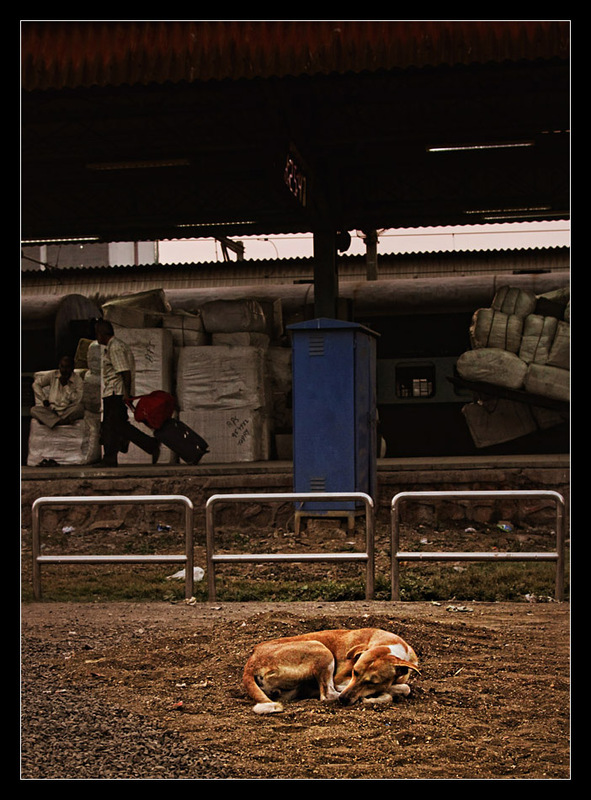 Until the next longer stop, Itarsi Junction (Jn. ), it shrank to 15 minutes, but afterwards was increased again to 45 minutes without any noticeable reason. Behind Hoshangabad we crossed Narmada River on the first large bridge I saw on the trip, later I would have another giant bridge along this river as photo subject. Out of paranoia bridges in India are often built as seperate structures for each track, in this case the other bridge was used by pedestrians. A lonely "ghat" (mountain) section followed dominated by leafless trees and tall dry grass. Back to the flatlands we finally reached rural India just as you envision it: hardly cars, mostly motorbikes and bicycles, cows everywhere and of course people doing their everyday tasks at possible and impossible places. Be it female construction workers balancing their loads on their heads or boys playing cricket trackside. The approach to Bhopal, a town of tragic fame due to one of the larges chemical disasters worldwide in the 80s, was dominated by poor shacks along the line. Here we met „Link Express“ from Hazrat Nizamuddin (a station in Delhi) with coaches to Hyderabad and Vishakapatnam. Then we continued towards Bina, 20 minutes later I spotted a train with Rajdhani coaches, the traditionally fastest Indian overnight train class, classic cars in red-white livery. A third track was being built here, apart from muscle power TATA lorries converted to rail vehicles were in use as well. During the whole trip we were met by one freight train after another, hauled by various loco classes, next to lenghty express trains. We left Bina with only 20 minutes delay, in India a lot of slack time is calculated into the timetables - sometimes about 1 hour for a 10 km ride - to avoid long delays at terminal stations, which is not always successful. Now I was served my first railway meal, known not to be very tasty on ordinary trains, but I could bear it. You have the choice between "veg" and "non veg", NV is supposed to include no vegetables at all. I had ordered vegetarian and received three different dishes on a tablet, rice and flat bread in a plastic bag. The pantry car was at the other end of the train, I did not want to walk that far. The following larger station, Jhansi Jn., had its fame as "cleanest station" - proclaimed on signs - not unjustified, the platform floors were sparkling. New platform roofs were built using concrete mixers and donkey power. Next we negotiated another ghat section via Datia and Dabra where both tracks were sometimes lead apart in a psychedelic way, crossing above each other in a right angle. Then it was time to prepare for getting out as we approached Gwalior. Of course the first time alone at an Indian station with masses of people is quite the culture shock. But everything is properly maintained and well labelled, I still had to get to the reservation centre to confirm my reservation for the following day. Once more a case of running the gauntlet as nobody really knew what to do with the Indrail pass and included reservations. Afterwards I noticed that they gave me a brand new reservation instead of my existing one. My unnecessary new reservation for 12001 Bhopal - Delhi Shatabdi, the fastest Indian train - with cement ad! I experienced the Indian version of queueing first hand, once you are at the counter people try to squeeze in left and right, one elderly gentleman with large turban got a little too close for my taste. After a short waiting time I got my confirmation and could move on to my hotel, in walking distance from the station. It is a different world here as in Mumbai, only dust along the streets, almost exclusively auto rickshaws in traffic. I had to traverse a roundabout, you can only step into traffic and hope that people will stop for you (which they do). Simply pure "shared spaced". My hotel was situated in a side street, next to a few others. Life at every corner was fascinating, even here. The hotel staff greeted my nicely and treated me with preference, free WiFi was also available. The room was alright, even if not in mint condition. The choices of tap water were cold and not-so-cold. Apart from that the room was well-equipment, even with an electric heater, at nights are quite cool here, during the day temperatures climbed to convenient 20-25° C. In the evening an employee of the car rental company came by, which I would use next day, to discuss my unconventional plans. Let's hope everything will work as planned!